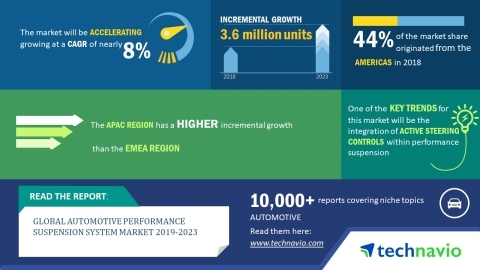 LONDON--(BUSINESS WIRE)--The global automotive performance suspension system market is expected to post a CAGR of nearly 8% during the period 2019-2023, according to the latest market research report by Technavio. A key factor driving the growth of the market is the increasing adoption of air suspension systems. Air suspension systems are innovative suspension systems mainly used in heavy commercial vehicles to reduce vibration and engine noise. They improve vehicle handling to a large extent by automatically adjusting the height of the vehicle according to vehicle speed and reducing resistance to wind while driving on highways. Vehicle makers are replacing the conventional coil-spring-based suspension system in high-performance cars with advanced air-suspension systems to increase the handling comfort of the vehicles. This market research report on the global automotive performance suspension system market 2019-2023 also provides an analysis of the most important trends expected to impact the market outlook during the forecast period. Technavio classifies an emerging trend as a major factor that has the potential to significantly impact the market and contribute to its growth or decline. Vehicle makers are upgrading their existing vehicular systems with digital systems to increase operational efficiency and safety. Suspension systems play an important role in maintaining vehicle stability, especially the ones used in high-performance vehicles. “Digitization of performance suspension system components has allowed vehicle makers to integrate various multiple electronic features in performance suspension systems to increase their overall operational efficiency and complement the handling capabilities of the vehicles. Integration of active steering systems in performance suspension greatly improves handling capabilities of high-performance vehicles,” says a senior analyst at Technavio for research on automotive electronics. This market research report segments the global automotive performance suspension system market by application (electric vehicle and non-electric vehicle) and geographical regions (APAC, EMEA, and the Americas). The non-electric vehicle segment held the largest market share in 2018, accounting for nearly 97% of the market. This application segment is expected to dominate the global market throughout the forecast period. The Americas led the market in 2018 with a market share of over 44%. This region is expected to dominate the market through 2023, however, there will be a decrease in its market share. The global automotive performance suspension system market is expected to post a CAGR of nearly 8% during 2019-2023, according to Technavio.